Each throwing lane is reserved with a deposit of 2 admissions. Your selected group size requires 2 throwing lanes so your deposit is 4 admissions. Reserving 2 lanes has a 26 ppl minimum requirement, which means you still have to pay for 26 people even if you have a smaller group size. 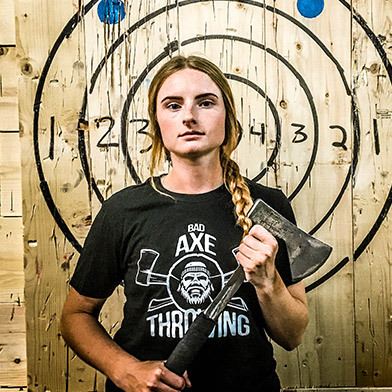 Burlington is where Bad Axe Throwing started! 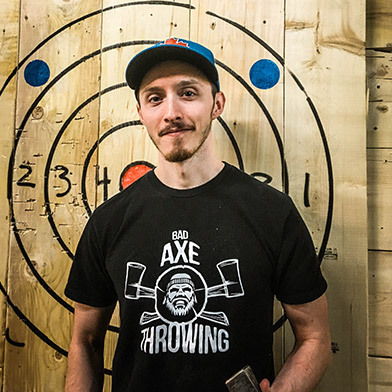 It was our very first location and where you can get an authentic and thrilling axe throwing experience. With perfect 5 star ratings across the board, we're ranked as the top fun & games destination on TripAdvisor. We're conveniently located off of Guelph line, just a few minutes from the highway and Burlington Mall, on Fairview Street. 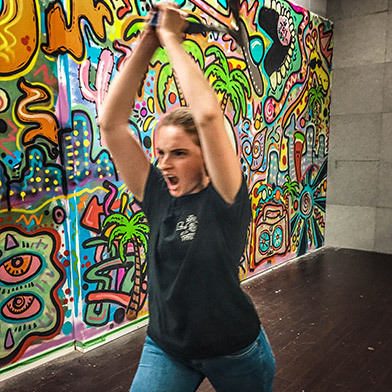 Our location features one of the best design graffiti spaces of all our venues across North America designed by local artists. We serve the Burlington, Oakville, Hamilton and Waterdown areas. 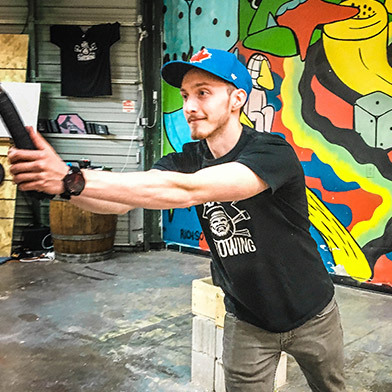 During your group event, you will have a dedicated axe throwing coach that will help you learn how to throw an axe, have fun games, tournaments and teach you awesome trick shots. Bring your friends, family, co-workers, acquaintances, dates and people you want to have a great time with, to the only place in the Halton region where you can have such an exhilarating experience. Don't forget, you can bring your own food, beverages and music. 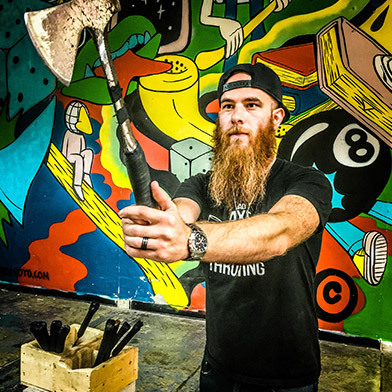 Get ready to tap your inner Viking! 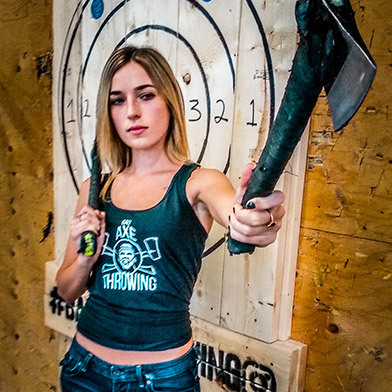 Book your axe throwing event today! 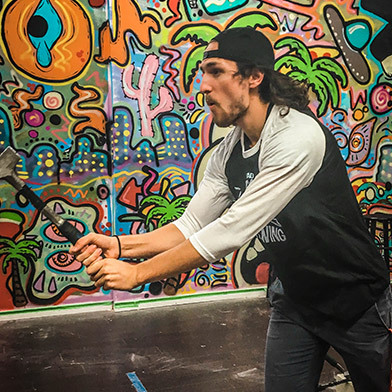 Had a super fun time throwing axes for a non-traditional bachelorette party. Definitely recommended for anyone looking to do a fun team building or just overall fun hangout activity! Had a great time! Staff are friendly and helpful! Great way to blow off steam! I would recommend this to parents of young teens, work groups, and anyone who wants to try something different. Great place indoors, safe, amazing and vigilant hosts, a wonderful wonderful time for everyone. Can bring your own food and drinks (although not alcoholic drinks of course)! 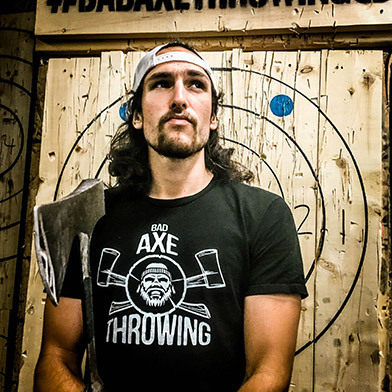 "Best Bad Axe time ever!" Went with a large group for a 50th birthday celebration. We thought it was a crazy idea! Alex the Gentle Ginger was amazing! He instructed, coached, led games, and even danced! We felt strong, safe-and competitive! We had an amazing time and found a new hobby! We will definitely be back soon!!! Thanks!!! "Great place to go with friends, family or for team building!" We had a BLAST ! 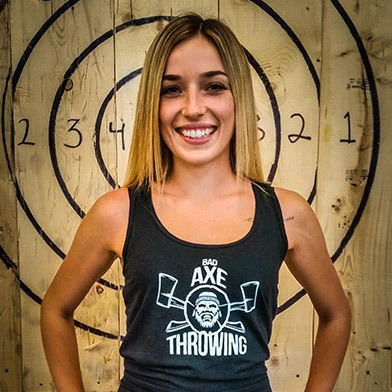 Amanda lead us through a series of great games and taught us those mad Axe skills :) So much fun ! We will definitely go back again and again. 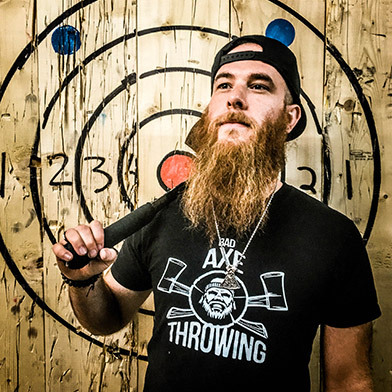 Our birthday party's last, on average, 2 hours with one of our dedicated Bad Axe Throwing coaches. To book an event a minimum group size of 8 people is required. Private events & bookings cost anywhere from $35 - 44.25 + tax per person.